There is considerable interest in odor and emission control. Emission control via add-on controls usually involves capturing or destroying chemical emissions before they are emitted into the atmosphere. Odor control is differentiated from emission control in that the odorous gas does not necessarily need to be removed from the process air; it only needs to be undetectable by olfactory senses. Therefore, expensive emission add-on controls need not be applied if the operator can successfully remove the odor. Frequently, emission control also results in odor control. If compounds do not enter the atmosphere our olfactory senses will not detect them. However, the technique used to capture an emission can itself emit an odor as a byproduct of the process, such as a chlorine smell emanating from a scrubber. Manufacturing sites are allowed to emit odorous compounds into the air up to a certain level per year. Nonetheless, regulations often disallow the site from emitting nuisance odors that disturb neighbors. Consequently, some manufacturers will turn to emission control when simple odor control suffices. Several popular emission control devices applied are chemical scrubbers, activated carbon adsorption devices, biological filters, thermal and catalytic converters and incinerators. Each has its benefits and shortcomings. Generally speaking, they all effectively treat the specific hazardous gases for which they are designed; however, they cannot control a broad spectrum of odors. Many emission control devices produce an odorous off-gas. Scrubbers often require handling of acids or caustics and all emission control devices are considered costly capital investments with most having high recurring costs. The efficiency of all emission control devices is measured by the ability to remove a specific gas (or gases) from the exhausting air with the removal rate measured in parts per million (ppm) or weight removed per unit time. Odor control, outside application of the above mentioned emission control systems, typically involves the introduction of a liquid aerosol, or atomized product, into the process air. This occasionally includes the use of masking agents that attempt to overlay a pleasant odor onto the malodor in an effort to "mask" the malodor. It is a stretch to say this technique actually controls odors because they cover them, not remove them. In addition to masking agents, one can find products that are plant oil based and claim to be odor neutralizers. A closer look shows that many are primarily masking agents combined with surfactants. Still, a safe, efficient, cost-effective odor control solution utilizing essential oil technology is available. With this technology, no effort is made to remove the malodor gas but to treat it so it is undetectable by olfactory senses. Although beyond the scope of this article, it is worth noting that developments in equipment and the understanding of how scientific oil blends function indicate that future application of this technology may well apply itself to emission control. Essential oils have been used for years to remove organic substances. Pine oils are used to dissolve grease and oil while lemon oil is often added as an apparent masking agent. When essential oils are carefully selected, unique characteristics of these oils assist in removing a broad range of malodors and do so by several interesting mechanisms. Because the oil blend has a characteristic pleasant odor, it is sometimes confused with masking agents. But differentiation from masking is obvious given the mechanisms of control. The mechanisms for malodor removal using a scientific and efficient blend of water soluble and insoluble essential oils include solubility, buffer solutions and chemical reactions. Solubility. When mixed with water and sprayed as a fine mist of atomized droplets into the air, water-soluble oils dissolve in the small droplets and change the droplet's polarity. The droplets become less polar thereby increasing solubility of most malodors. Non-water soluble oils form a thin surface layer on each atomized droplet, which creates a negative electrostatic charge on the droplet's surface. This causes the droplets to repel each other (like charges repel) and stay in an atomized form for longer time periods. The electrostatic charge also facilitates attraction of malodor molecules to the droplet surface whereby they absorb into the droplet. This solubility increases droplet density and brings about coalescence and removal of the malodor from the vapor state. The odors we smell come from malodors in the vapor state. Once trapped in solution, they have no odor, except for some that return to the vapor state. Polarity changes of water also act to change the distribution constant - for example, the amount of gas that stays in solution versus the amount that returns to the vapor state - and prevent odors from returning. Consider a simple analogy. When standing over an odorous pond and sensing malodor, one does not smell what is in the pond, one senses the gases leaving the pond. When gases are absorbed into the droplets or attached onto the droplet surface, they are not released for the olfactory senses to detect. Buffer. The essential oil mixture contains both weak organic acids similar to citric acid and salts of these acids that form a buffer solution. Buffer solutions can neutralize both acidic and basic malodors, and more importantly, they greatly increase the solubility of acidic and basic malodors in droplets. Buffers not only facilitate solubility but also can partially neutralize many malodors in a fashion similar to acidic or caustic scrubbers. Chemical Reactions. Many organic compounds, such as styrene, are stable in the vapor state but degrade rapidly once in solution. Other compounds stable in the vapor state will degrade slowly once in solution. In some cases, degradation of malodors in solution is so slow that for practical purposes it appears non-existent. Getting malodors into solution is the first step in helping nature destroy malodors. Because large amounts of water are used during the misting process, malodors in solution are greatly diluted and their concentrations fall below detectable levels. University and independent laboratory tests confirm the existence of these odor control mechanisms specific to at least one commercially available odor control product utilizing a specific essential oil blend. Reductions in compounds, such as styrene, hydrogen sulfide, sulfur dioxide, ethyl and methyl mercaptans, ammonia and other amines are documented. 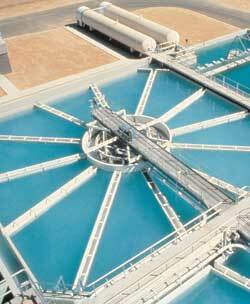 Field tests at wastewater plants and industrial sites produce similar results. A carefully selected essential oil mixture can remove malodors from the environment through a combination of mechanisms with solubility being the first and of greatest importance. This mechanism is aided by the use of extremely small water droplets moving at high speeds, changes in water polarity, the effect of electrostatic charges on droplet surfaces, pH and capacity of the mixture's natural buffer and prevention of the dissolved malodor in returning to the atmosphere. Removal is increased by natural malodor degradation and several possible chemical reactions taking place while in solution. directly mixing it with odorous slurries. Although designed for odor control, under correct conditions essential oils can be applied for emission control of several malodors. Essential oils can be used to control virtually all odors by adjusting their concentration and mixture makeup, their application rates, their forced or no forced coalescence, and their pH. Because essential oil mixtures have characteristic scents they may also exert a masking effect. The masking effect should not be considered a mechanism for odor removal. When a good essential oil mixture is used properly, no odor should be detected - neither the malodor nor the natural fragrance of the oil blend. A difference does exist between odor control and emission control. Both have their place in the environmental industry. Selecting one technology over the other is a function of individual facility needs and solution cost effectiveness. Should a facility need to reduce or remove hazardous gases emitting from its process for legal or environmental reasons, emission control technology is available. Should a facility need to reduce or remove odors that are irritants to employees or neighbors, a simpler cost-effective odor control technology is available. This article originally appeared in the March/April 2002 issue of Water & Wastewater Products, Volume 2, Number 2, page 28. This article originally appeared in the 03/01/2002 issue of Environmental Protection.